Situated just down from the GO Ape! Adventure Park at Dukes Pass, the Bield Guest House in Aberfoyle enjoys some of the views of the Trossachs this side of Loch Katrine. The Village is only a few minutes walk away. 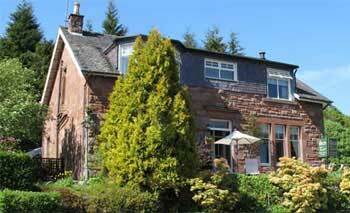 This large Victorian guest house dates back to the early 1900s and offers a handsome and traditional base from which to explore the Trossachs. The most immediate attractions locally include the Go Ape! Adventure Park. The Park offers a great day out for all the family and is especially good for getting to grips with your 'inner Tarzan'. Set in the magnificent Queen Elizabeth Forest Park, Go Ape! features everything from tree-top adventures to jaw-dropping 400 metre zip-wire rides - a must for thrill-seekers everywhere. The guest house itself retains much of its Victorian elegance and the rooms are decorated to a very high standard indeed. All rooms boast en-suite bathrooms and although there may not a huge volume of rooms on offer, there is a good range of types: including one king size room, one double and one twin room. A full Scottish breakfast will is served daily in the Guests Lounge. Private off road parking is available to guests and the owners of the Bield are able to provide safe storage for bikes. Guests also get a concessionary rate on tickets for Go Ape!. If you fancy learning more about the Bield, call +44 (0)1877 382351.